The best riders from all over the world, Korea to Brazil, the USA to Australia, are battling for the world title, within this fast growing sport. Yes, the seventh edition of the world championships longboard dancing and freestyle “So . 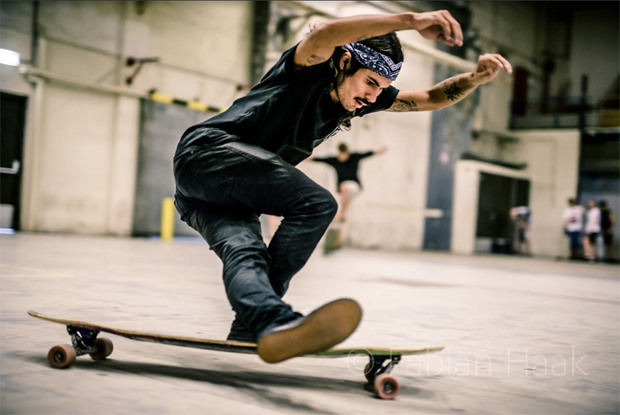 . . You Can Longboard Dance?” is to be held at the ‘Klokgebouw’ in Eindhoven, the Netherlands. Longboarders are very present in every day city life. For many they’re ideal transportation, some riders are out to improve surf skills, other just want to cruise around with (new) friends, others just like to look cool, or get some exercise. Some riders charge off a mountain with 100 km an hour and some transform it into an art form. Longboard ‘Dancing’ and ‘Freestyle’ is what this event is about. The level nowadays is so spectacular that even non-longboarders are fascinated and can watch it for hours. Within longboard dance flow, creativity, combinations, speed, style and difficulty is key. Each ‘run’ lasts 1 to 1.5 minute. For those who are inspired to try themselves, there are free longboard lessons. For those who already longboard there is, separate from the competition area, an enormous ‘free skate area’ with obstacles. The competitions are for a broad variety of longboarders. There is a ‘groms’ competition where the youngest longboarders show that they are the future. Next to the Dance ‘Open’ en ‘Women’ competitions for the sponsored pro riders, there is also a competition for ‘non sponsored’ riders. The best of this competition are scouted by longboard brands and will compete in the pro class next year. The hippy jump competition is exciting because the end result is always close to the world record. In 2013 the world record at the time was broken during the event. ‘Best Trick’ and ‘G-Turn’ are also breathtaking thrilling. Will a spectacular trick be landed at the ‘moment supreme’? ‘So . . . You Can Longboard Dance?’ is organized by Flow Provider - April 20th and 21st 2019 Klokgebouw Eindhoven, the Netherlands. Entrance free.